Liverpool has been in the news over the past few months since it applied to be able to handle turnaround cruises at its government-funded Liverpool Cruise Terminal in the Mersey, a facility that has received UK and EU grants on the basis that it be used only for visiting cruise ships and not for embarkations and turnarounds. Liverpool City Council, owners of the facility, now think they have come up with a solution to their problem by paying back the UK part of these grants. While this debate has been going on, however, Liverpool was made to look very foolish last week when a local newspaper announced that Cunard Line would operate a Transatlantic service between Liverpool and New York, only to be rebuffed on Friday in a terse statement from Cunard saying that it had no such intention. Elsewhere, for those English-speaking passengers who would like to be able experience a French-speaking cruise ship in English-speaking company, the Ocean Liner Society will be undertaking its 2012 group cruise on board Croisières de France’s all-inclusive Horizon this May. Finally, we bring you a brief update on the situation with the Costa Concordia. Is a Liverpool Revival in the Works? Liverpool hit the news again last week when an article by Peter Elson in the “Liverpool Post” announced that Liverpool would once more be able to host Transatlantic departures for New York, an event that has not occurred since Cunard performed its last Liverpool-New York sailing in 1967. Until the early 20th Century, Liverpool was indeed the UK’s most important port for steamship sailings to the New World. In fact, its role as a major host port for Transatlantic steamship lines lasted for more than one hundred and thirty years, from the first sailing by Cunard’s Britannia for Halifax and Boston on July 4,1840. Even before that, Liverpool had been the base for major lines of sailing ships, including the famous Black Ball Line, which opened the first scheduled North Atlantic service in 1817. While Cunard says it has no intention of offering Transatlantic sailings from Liverpool, it is known that it may want to celebrate the 175th Anniversary of the Britannia’s first sailing by bringing all three of its Queens, Queen Mary 2, Queen Elizabeth and Queen Victoria to Liverpool together in 2015. Although all three of them have been to Liverpool on their own, however, where all three of them might berth is an open question. Liverpool’s big competitor, the port of Southampton, only came to the fore in 1907, when the White Star Line moved its New York express service to the southern port and opened new offices in Canute Road. Five years later, on April 10, 1912, that line’s 46,329-ton Titanic departed on her never-to-be-completed maiden voyage to New York. Indicative of how recent the change had been, the Titanic still carried Liverpool on her stern as port of registry, as this was still where the White Star Line was headquartered. By 1912, with the opening of emigrant services to Canada, South Africa and Australia, Southampton had surpassed Liverpool as the UK’s busiest passenger port. Although Southampton was now ahead of Liverpool, it had taken place almost seventy years. The port’s first coup had come about in 1843, when the Admiralty moved its famous fleet of mail-carrying “Falmouth packets” to Southampton. It was not until 1919 that Cunard Line moved its own New York express service to Southampton. From 1909, Cunard had been experimenting with the Welsh port of Fishguard. From there, trains carrying passengers and mail could reach London’s Paddington Station in about four and three-quarter hours. 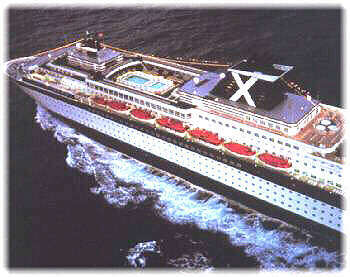 Cunard was still operating its New York express service over Fishguard when the Titanic was lost. By the 1920s, however, both Cunard and White Star had negotiated mail contracts to supply weekly services from Southampton to New York, with White Star ships leaving on Wednesday and Cunard ships on Saturday. Cunard and White Star would merge in the famous consolidation of 1934 that produced the Cunard-White Star Line, which introduced the Queen Mary into service in May 1936. Cunard did not abandon Liverpool until 1967, when the Carinthia sailed for Montreal for the last time on October 13 and the Sylvania made the last passenger sailing to New York on November 30. The Sylvania had replaced the last White Star liner, m.v. Britannic, in the historic Liverpool-New York service in 1960. Thereafter, all Cunard Transatlantic sailings took place from Southamptonm although there were cruise visits to Liverpool and the line christened its last Caronia, now Saga Ruby, there in December 1999. Meanwhile, Canadian Pacific lasted four years longer than Cunard, and the Empress of Canada made her last Transatlantic voyage from Liverpool to Montreal in November 1971. The Empress of Canada was then sold to Carnival Cruise Lines to become their first cruise ship, the Mardi Gras. More than a quarter century later, in 1998-99, the Empress of Canada returned to Liverpool to cruise from that port as the Apollon, working for Direct Cruises. This did not last long, however, as in 1999 the owners of Direct Cruises sold out to Airtours. Already having a cruise business of its own, Airtours decided to close Direct Cruises down. And although it was headquartered less than fifty miles from Liverpool, Airtours’ cruise operations concentrated on fly/cruising from Mediterranean ports rather than sailings from UK ports. Carnival Corporation had taken a 30% interest in Airtours in 1996 and although the two companies jointly invested in Costa Cruises between 1997 and 2000, Airtours’ ultimately closed its cruise operation, selling its ships to Louis Cruises in 2004. Key to Liverpool’s passenger and cruise operations over the years has been the Princes Landing Stage, a floating facility located at Liverpool’s Pier Head. The original 508-foot landing stage, connected to the shore by two 150-foot bridges, was opened in 1847, and allowed ships to berth in deep water no matter the state of the tide. The present 1,150-foot long facility, owned by Liverpool City Council and operated by Peel Ports, and perhaps misleadingly (so far) called Liverpool Cruise Terminal, was opened in September 2007. That ceremony took place during a call by the Queen Elizabeth 2, a ship that when she first visited Liverpool in 1990 for the 150th Anniversary of the Cunard Line had to anchor out in the river and use Mersey ferries for tenders. While the Liverpool Cruise Terminal was designed as a port of call and not for turnarounds, ironically, not far away, Cunard’s old first class departure lounge remains intact on the ground floor of the Cunard Building. Cunard’s old headquarters, now owned by a pension fund, was completed in 1917 and is mooted for possible conversion into a luxury hotel. Neverthless, the opening of the Liverpool Cruise Terminal was a big step forward in restoring Liverpool to a prominent position in the cruise trade, even if only for incoming ships. Previously, large ships had either had to anchor in the Mersey and tender passengers ashore or lock through into the Liverpool’s enclosed dock system, neither of which was ideal for visiting cruise ships. Liverpool’s present embarkation terminal is Peel Ports’ Langton Dock, an unattractive facility both aesthetically and operationally. Located in a run down area of the port close to a scrapyard, it has actually lost traffic to the port. For example, Fred. Olsen Cruise Lines, after having tried Langton Dock, has been absent from Liverpool for three years. As well as the Liverool Cruise Terminal and Langton Dock, Peel Ports operates the Greenock Ocean Terminal in Scotland, which last year embarked a total of 12,600 passengers on nine cruises operated by Fred. Olsen, Saga and Cruise & Maritime Voyages. Meanwhile, Liverpool hopes that cruise turnaround operations can begin this summer. Last week it announced that a planning application to create temporary a cruise check-in facility at Liverpool Pier Head was being submitted to cover the nearby Princes Dock, Plot 7. If approved, the first 2012 cruise ship departure, Cruise & Maritime Voyages’ Ocean Countess on May 29, could take place from Liverpool Cruise Terminal. Cruise & Maritime have scheduled eleven Liverpool departures for the Ocean Countess, a ship that was originally the Cunard Countess, as well as an inward call by the Marco Polo. Despite earlier Liverpool sailings by lines such as Fred. Olsen Cruise Lines and Thomson Cruises, the Ocean Countess is still the only ship scheduled to cruise from Liverpool this summer. Neverthless, progress is being made. 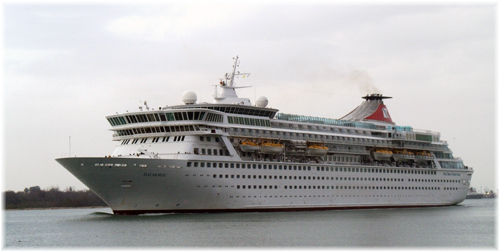 Fred Olsen, absent in recent years, has now announced that it will make ten cruises from Liverpool in 2013 using the Boudicca. 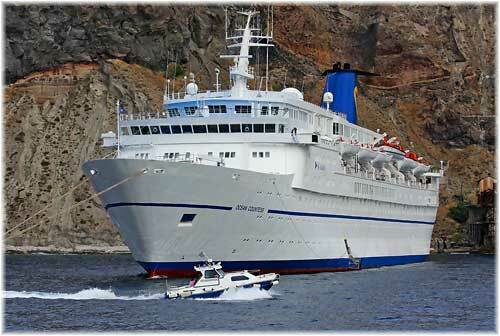 To take place between April and August, these will range from a 4-day mini-cruise to a 12-day cruise to the Canaries. Others will go north to Norway. Eventually, more departures can be expected as well as the area around Liverpool and Manchester, a forty-five minute drive away, is the UK’s third most populated region, with an immediate population of about seven million people. The main opposition to using the Liverpool Cruise Terminal for turnaounds has come from the UK’s biggest cruise port, Southampton, whose four cruise terminals handle over 300 ships a year, with a fifth terminal proposed. But ports in the north have been equally vociferous. While Liverpool has eleven Ocean Countess embarkations scheduled this year, Hull and Newcastle each have nine by the same ship, Greenock has eight split evenly between Ocean Countess and Boudicca and Edinburgh has eleven embarkations, five each by Boudicca and Cruise & Maritime’s Marco Polo, and a single departure for Azamara Journey. Hull and Dundee also have single departures booked for Classic International Cruises’ smaller Arion. 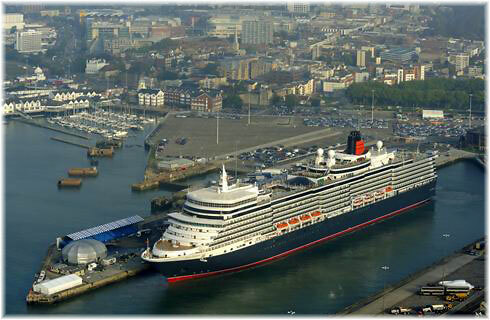 Local departures can save northern passengers a six or seven-hour drive south to Southampton. Meanwhile, nineteen inward calls are scheduled for Liverpool this year, four by Princess Cruises’ 112,894-ton 3,114-berth Caribbean Princess, the largest ship to call in 2012, a return visit by Cunard’s Queen Elizabeth in August, calls by P&O’s Arcadia and Adonia, three calls by Saga, two each by Holland America’s Prinsendam and Aida’s AidaCara and single calls by Fred. Olsen’s Balmoral, Royal Caribbean’s Vision of the Seas, TransOcean’s Astor, Phoenix’s Albatros and Marco Polo. Twice this summer, Liverpool Cruise Terminal will have three ship visits on three consecutive days. While the Liverpool Cruise Terminal controversy has been ongoing, in January Peel Ports submitted revised plans for a £5.5 billion world-class waterfront, to be called Liverpool Waters, and located not far away. Ultimately, this plan could also help lure more new cruise trade to the city as included in the plan is a second cruise terminal, to be built alongside 9,000 new homes, new office skyscrapers, hotels, restaurants and shops. But the dockland plans, dubbed “Shanghai on Mersey,” have also come under fire from groups who fear that they would put Liverpool’s World Heritage status at risk. The site spans 150 acres of unused dockland, all of it within Liverpool’s World Heritage site. Peel’s plans call for a new landing stage to be built just off the Central Docks, linked to a 180,000 sq ft building that would house a cruise ship facility and hotel. Approval would be needed from Parliament to allow a second floating landing stage. If Liverpool councillors approve the plans at a meeting scheduled for March 7, detailed plans for individual buildings will follow. The scheme calls for a mini-city on the Mersey, the largest regeneration project in the UK, and could create 15,000 new jobs. Peel envisage a start this year, with a thirty-year building programme leading to a finish in the early 2040s. Among Liverpool’s hotels, the 402-room Adelphi, opened in 1826 and rebuilt in 1912, is an institution that was once regarded as one of the best hotels in the world. Like Hamburg’s Vier Jahreszeiten, built in 1897, and Atlantic Hotel of 1907, the Adelphi was where first class passengers used to stay before boarding luxury liners for passage to New York. Indeed it was Charles Dickens’ favourite hotel, and the one he used when taking Cunard’s Britannia across the Atlantic for his North American tour in 1842. Today, with its grand and elegant lobby and banqueting hall, high ceilings and chandeliers, it is still quite stunning, but its reputation has fallen. Of those rating the now Britannia Adelphi at TripAdvisor, 32% rate the hotel as excellent or very good, but fully 50% rate it as terrible or poor. On the other side of Liverpool’s Lime Street Station, The Liner Hotel, with 152 rooms, and meeting rooms named for ocean liners, crafted from the old Gladstone Hotel, receives 74% excellent or very good ratings at TripAdvisor, as does the Liverpool Hilton. 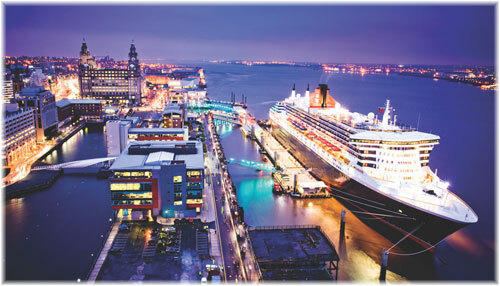 All in all, recent times have not been good for Liverpool as a cruise port but things now seem to be improving. As long as funds that were earmarked for a visiting cruise ship terminal are paid back, then Southampton and other ports will have no grounds to protest. But the coast is not clear yet, at least until the UK government agrees that it is willing to be repaid out of revenues and as long as the European Comission doesn’t also claim back the £8 million that it provided as well. For English-speaking passengers who admire the French way of doing things, there is an opportunity to cruise on France’s latest cruise ship once the 46,811-ton Horizon enters service from Marseilles for Croisières de France this spring. Like its parent, Madrid-based Pullmantur, Croisières de France offers an all inclusive product, meaning that drinks are included as well as meals, and at very reasonable fares. The story goes back two years to 2010, when the Ocean Liner Society chose Croisières de France and its 37,301-ton Bleu de France, a ship that had been built in 1982 as Hapag-Lloyd Cruises’ last Europa, for its annual cruise. That all-inclusive cruise proved such a success that in 2012 the Society is returning to Croisières de France to sample its latest ship, the Horizon. This year’s Ocean Liner Society cruise departs Marseilles on Sunday, May 27, for Portofino, Rome, Salerno, Trapani and Valetta, and offers a full day at sea before returning to Marseilles. For those who follow new ship inaugurations, MSC will also be christening its newest ship, the 140,000-ton MSC Divina, at Marseilles on May 26, the day before the Ocean Liner Society departs on board Horizon. Horizon was the first new ship to be built for Celebrity Cruises, a company formed in 1988 as the upmarket division of Chandris Cruises in order to fulfill a new contract with Bermuda to replace Home Lines on the New York to Bermuda route. For this contract, Celebrity built two sister ships, the Horizon of 1990 and the Zenith of 1992. In 1997, Royal Caribbean Cruises Ltd took over Celebrity Cruises, building seven newer and bigger ships of the Century and Millennium classes that eventually made the Horizon the smallest ship in the fleet. In 2005, Horizon was allocated to a new Royal Caribbean joint venture with TUI Group called Island Cruises, taking the name Island Star. When Royal Caribbean withdrew from Island, she then joined her sister ship Zenith at Royal Caribbean-owned Pullmantur Cruises in Spain, and was renamed Pacific Dream. Now sailing once more under her original name, Horizon joins Pullmantur’s French-based cruise operation Croisières de France in a few weeks, replacing Bleu de France, which is going to Saga Cruises as their Saga Sapphire. After a month-long dry-docking at Genoa’s San Giorgio shipyard, the Horizon enters service with Croisières de France on April 8, and will offer 38 Mediterranean cruises this year from Marseilles. Her official inauguration will take place in Marseilles on April 28. This year’s Horizon fares compare well with the Bleu de France fares in 2010, starting at €510 per person in an inside cabin compared to €585 in 2010 and €630 per person in an outside cabin compared to €850. Balcony cabins are also available at €1095 per person and the single supplement for any grade is a flat €275. Fares are all-inclusive of cruise, full board, port charges and drinks, spirits, wine and beer in dining rooms and bars on board, while a service charge of €65 per person will be charged on board for gratuities. Members of the general public can join this cruise simply by joining the Ocean Liner Society. The cost of £20 in the UK, £23 in Europe or £25 in the rest of the world also includes a subscription to the Society’s 48-page quarterly journal, called Sea Lines. As a non-profit organization, the Ocean Liner Society celebrates the passenger ship in its many forms and members include shipping company employees, authors, ship enthusiasts and inveterate travelers, among others. Further details can be found at www.ocean-liner-society.com. As the general media have been covering the drama, we have not been commenting on the Costa Concordia tragedy. 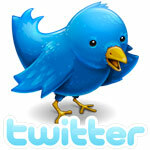 However, there are one or two pieces of news that we feel are worth commenting on. Firstly, should the elements allow, Costa have now announced that they intend to refloat the ship in one piece. Others commenting have said that she is too big and will have to be cut up into sections. Ultimately, it will be the findings of the salvage company that will decide. Ten salvage companies, Smit Salvage, Svitzer Salvage and Mammoet Salvage, all of the Netherlands, Titan Salvage, Resolve Marine Group, T&T Marine Salvage and Donjon Marine, all of the United states, Tito Neri of Italy and Fukada Salvage and Nippon Salvage of Japan, have been asked to tender on the wreck’s removal. Meanwhile, reports from US sources say that the ship’s insurers apparently favour Bisso Marine, a fifth-generation family business in New Orleans and Houston. While Bisso was not even on the bid list it is always possible that they or their equipment might be subcontracted. Meanwhile, Smit Salvage is already on the scene as they were commissioned to remove the fuel from the wreck, about 40% of which has now been recovered. A final choice of salvage company is expected to be announced in March. Should the Costa Concordia be righted and refloated intact, it seems that Costa have now given up any hope of placing her back in service again, indicating that in all likelihood she will be towed to a scrapyard. The damage to her port side is already evident, but that to her bottom and starboard side is as yet unknown. Finally, according to Seatrade Insider and sources in Italy it appears that Costa Cruises bookings are down more than a third since the tragedy, as the line fights to protect the integrity of its brand. While other lines suffered lesser downturns, their bookings have started to rebound again after quick action by the cruise lines and public reassurances from the Cruise Lines International Association, the European Cruise Council and the UK’s Passenger Shipping Association. The most important action has been that cruise lines have all now agreed to introduce mandatory safety drills before departure, something that exceeds International Maritime Organisation requirement that drills should be held within twenty-four hours of sailing.